Im Moment versuche ich meine neuen Weihnachtsstempel und Stanzen einzuweihen und dabei ist diese Karte entstanden. At the moment I'm playing with my new Christmas stamps and die cuts and this is what I came up with. I've always fond of this layout. It's simple yet very pretty. 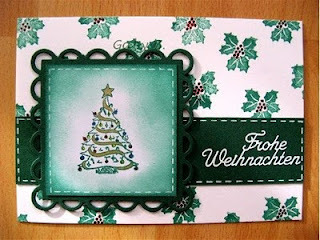 Love the scallop frame and the tree stamp is so cute!